With blinds at 8k/16k, action has really picked up on the final day of the EPO2012. Chris Bjorin just busted Ben Jackson out in sixth place (£15,180) to win a pot worth 318,500 chips. Jackson moved all-in with Ah-5h, only to be called by Bjorin and his pocket rockets. The board failed to improve Jackson’s hand and he was out of the tourney. Chip leader Jamie Roberts also busted Niels Ladefoged to push his stack over 1.5 million. As for how the hand went down, Ladefoged moved all-in from the cut-off with J-K suited, and Roberts called with pocket jacks. The board failed to improve Ladefoged’s hand, which gave Roberts the 463k pot. Niels can’t be too sad about being eliminated though because he did collect £10,350 for finishing seventh. Just a few hands prior to this, Thomas Laumier was knocked out of the tournament in eighth place (£8,280). He was hoping to steal a pot in late position after moving all-in with Js-8s; however, Surinder Sunar made a great call from the small blind with Kd-Qd. 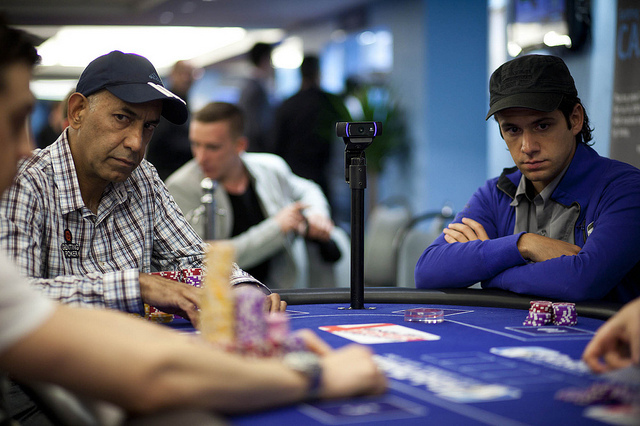 When the board was dealt 3s-5d-Td-7h-7d, Surinder took the hand along with a 385k pot.